Want to know more about our apprenticeships? We’re going to be out and about over the next few months, appearing at events across the country to let people know about all the opportunities on offer at The British Racing School. You’ll get the chance to explore our range of courses and apprenticeships, chat to our team and ask any questions you have about what a career in the horseracing industry is like. 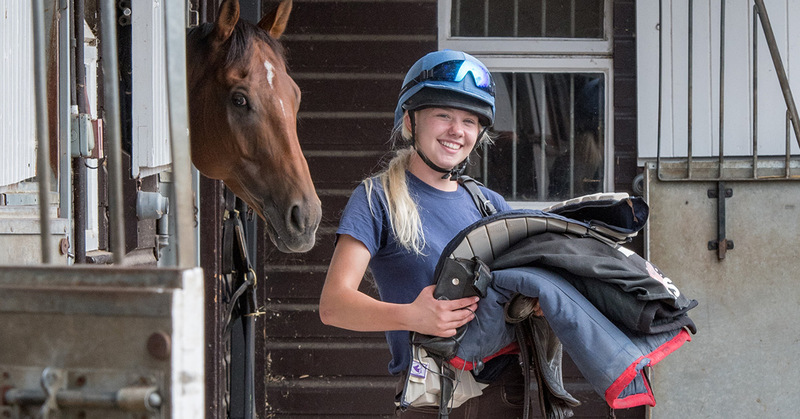 It’s a great way to find out more about what life is like at The British Racing School, whether you’ve always wanted to work with horses or the thought is a completely new one to you. Our first stop is at Old Trafford, Manchester on 8th February for the UK University Search Fair. Following that we’ll be at Sandown Park in Esher on the 5th and 6th March, and Arena MK in Milton Keynes on the 12th and 13th March for the National Apprenticeship Show. Our last stop will be on Friday the 22nd and Saturday the 23rd March at Exhibition Centre Liverpool for What Career Live? Come along and get the right information to help you make a decision that will shape your future. We’d love you see you!